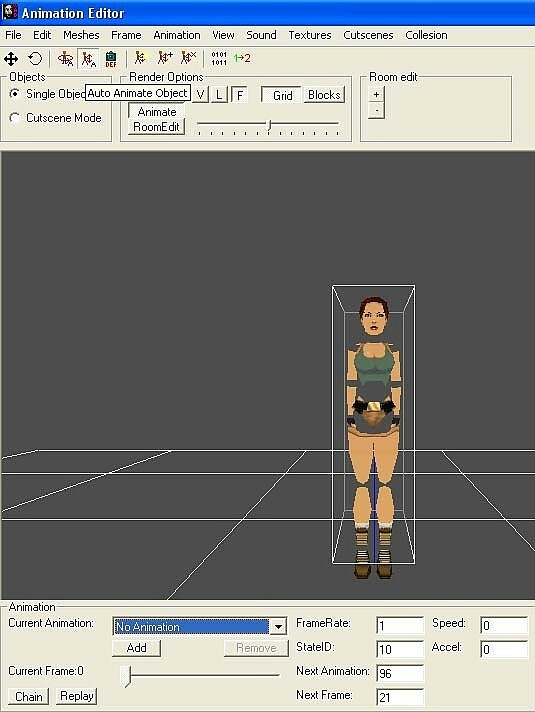 This tutorial will show how to replace one of Lara's animations with a downloaded animation. I'm using the one-handed grab animation by Zolee as an example. Fire up WadMerger and Open your wad in the left panel, select the Lara object and open animation editor. Click on the auto animate object button (4th from the left) to prevent Lara from animating. Now from the current animation drop down box select the animation you want to replace, in this case it's animation 96. 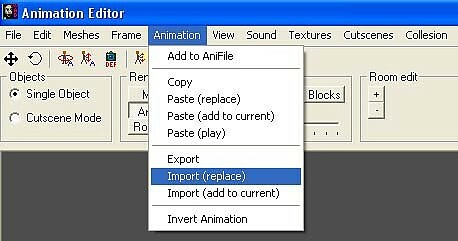 From the top toolbar select Animation > Import (replace). Browse to your downloaded trw file and open it. The animation will be replaced; use the slider located below the current animation box to check the new animation. Close animation editor and answer yes when prompted to save the changes. Remember to save your wad before closing WadMerger.